Exciting news for those living in Johor and Perak! 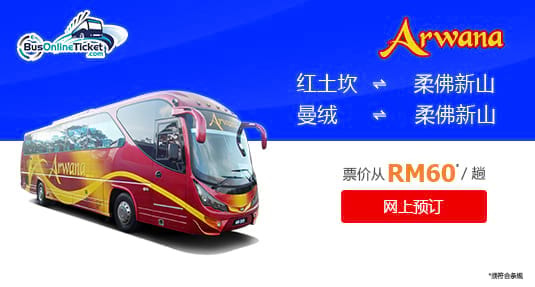 Arwana Express bus services that run between Johor Bahru, Lumut and Manjung are now available for online booking at BusOnlineTicket.com. You can now conveniently book Arwana Express bus tickets online in advance! Arwana Express is the leading bus operator specializing in providing bus service between the southern part of Perak and the southern part of Malaysia, Johor. All the buses deployed by Arwana Express are 30 seats VIP buses in excellent condition and fully air-conditioned. The bus services provided by Arwana Express are bus from Muar to Lumut, Manjung to Batu Pahat, Muar to Manjung, Batu Pahat to Lumut, Manjung to Muar and many more. The bus services mentioned above are important to connect people between the Northern region and the Southern region. Local residents in Lumut and Manjung especially working adults or students in Johor Bahru or Singapore prefer to take bus to travel between these cities during weekends or holiday seasons. So, check out the bus ticket availability between Johor Bahru, Lumut and Manjung now! Book your bus tickets now at BusOnlineTicket.com and travel with Arwana Express. You can secure your tickets in advance to avoid disappointment especially during weekends and public holidays.